I don’t know if it’s because I’m having a baby girl, but I’ve been adding ruffles to everything. Well, not everything but you know what I mean. 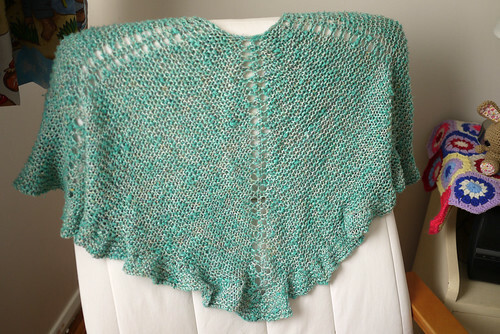 If you look at my Ravelry project page, I haven’t used ruffles before I got pregnant. Must be the hormones. First I knitted a shawl for myself and added ruffles to the edge. 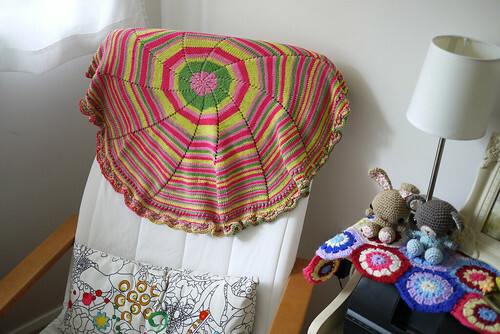 Then I knitted a small pinwheel blanket for the bubba and added a ruffle edge to that. It’s actually a lace border but it turned out ruffley anyway. 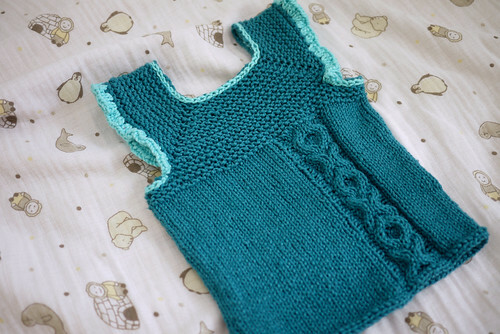 Finally I finished off the Milo baby vest with even more ruffles! 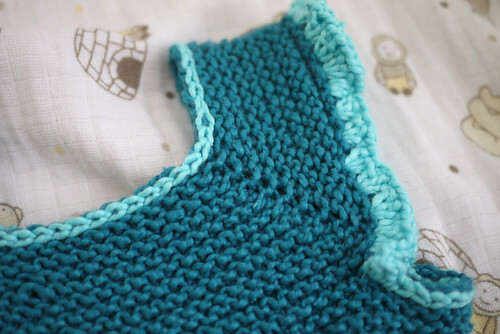 I blogged about this soft cotton vest two months ago and I finally got enough motivation to finish it recently. My gauge was off. So instead of fitting my girl in spring, it’ll fit her in summer or fall next year. Oh well. Better too big then too small. 1. Cabling without a needle. Easier than I thought it’ll be and the cables went much faster. 2. 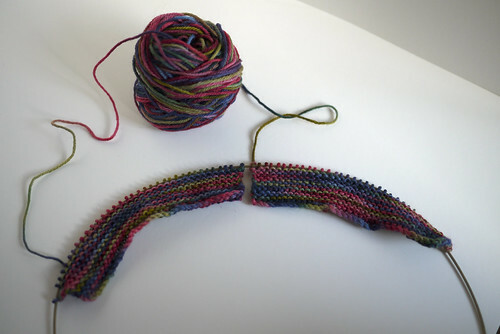 Decrease (or lace) bind off to create a stretchy bottom hem. The ruffles were crocheted and it was just trial and error really. What do you think? Early announcement we are unveiling a new shopfront in the next few weeks, so look out for it! Meanwhile, to clear stock of yarns are we will no longer carry, there is a 30% off sale till the end of June on many many items. If you have come this far, then its a home run from here. Take it step by step and soon you will have a handknitted sock! You should have 16 st on Needle 1, 32 st on Needle 2, 16 st on Needle 3. Knit in stocking stitch for sole of foot. ( Needles 1 and 3) Stocking stitch is knit every round. Continue until the foot of the sock measures 5cm less than the length of your foot. Needle 1: Knit to 3 stitches before Needle 2, k2tog, k1. Needle 2: K1, k2tog, knit to 3 stitches before Needle 3, k2tog, k1. Needle 3: k1, k2tog, knit to end. Repeats rounds 1 and 2 until there are 16 stitches left on Needle 2. Kitchener stitch the toe closed. Its not as scary as some make it seem, though it can be confusing. This link may be helpful or check out this video. I love the Kitchener stitch seamless toes. I always finish weaving all the stitches together before adjusting each stitch to make it as even as possible on the toe. Alternatively you can 3 needle bind off, but then you will have a ridge on the toe of your socks. YAY! one sock done, now weave in the yarn ends and knit sock 2. This pattern will be available as a download in the new shop. 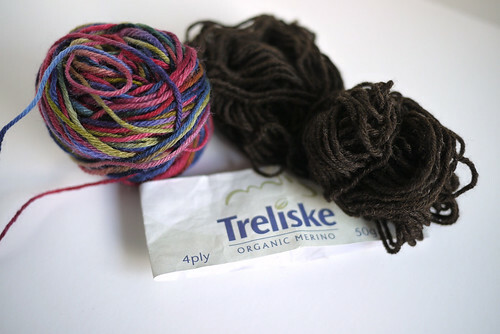 Have you ever finished a project and had a tiny bit of yarn leftover? It’s such a shame to just chuck it back into the stash and forget about it. That’s exactly what happened to me after I finished knitting the baby kimono. I really wanted to knit a pair of booties to match the kimono but the question is do I have enough yarn? Oh, the stress! I wanted to use every last bit of the yarn so I had two choices. I could weigh the yarn and knit precisely half the amount per bootie. 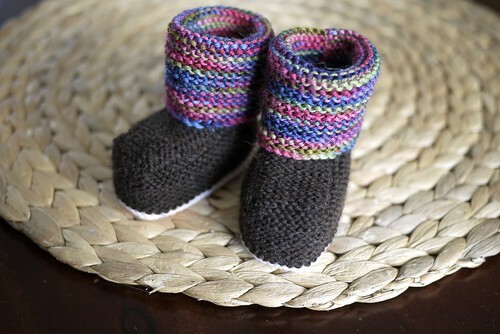 The second option was to cast on both booties at the same time using the two ends of the ball of yarn and knit both sides at the same time. This is what I chose to do. But there was a small hitch. The yarn kept tangling up! Bugger. So my hero aka hubby came to the rescue. I asked him to make me a yarn organiser. Naturally he had no idea what I was talking about but he was more than happy to help. 1. Start with a plastic container. I used a round one with a screw on top. 2. Mark 2 holes on opposite sides of the lid. 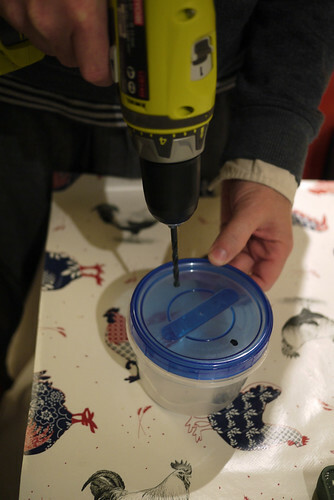 Drill holes. Tidy up any sharp edges with a file. You don’t want your yarn to get caught in the holes. You can stop here if you haven’t cast on yet. 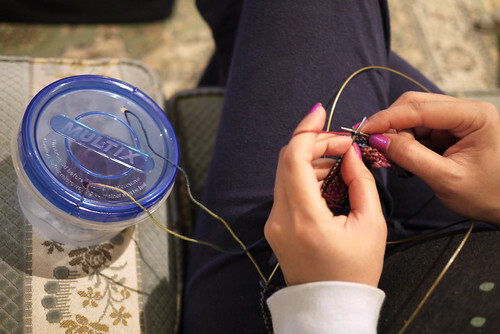 Just pop the yarn into the container and thread the ends of the yarn through the holes. BUT if you’re like me and in the middle of a project, you will need the following steps. 3. 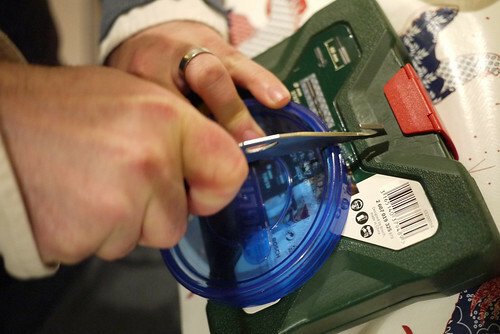 Using a small serrated knife, cut through the lid towards the holes. Use the pictures below to guide you. Again use a file to make sure all the edges are smooth. Drop the ball of yarn into your new yarn organizer. Using the slits on the lid, thread the yarn into the holes. 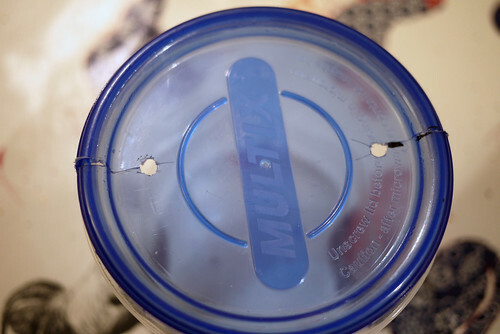 Screw the lid back on. Knit away! Pretty easy, huh? So I knitted until I ran out of one colour and then changed to the other colour. I ran out of yarn for the soles and just used a small amount of unlabelled pink yarn from my stash. Worked out perfectly actually! Who would have thought.